If you have a garage door that is not working properly, this can create a safety risk at your home or business in addition to being an inconvenience. When you call on Action Garage Door for help, you won’t have to wait long to have your garage door fixed. 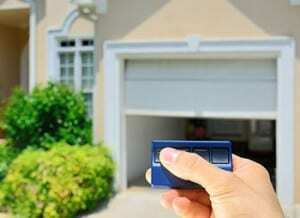 Our company provides the best garage door repair services in the Taylor area for residential and commercial customers. Our services include same-day service for your convenience, as well as 24-hour emergency services. The technicians at Action Garage Door have years of experience and training performing garage door repairs. This means that you can depend on us to have your garage door working safely. Give us a call for more information. Whether you need installation, maintenance, or repair, Action Garage Door is the premier garage door company in Taylor. Our licensed professionals have the knowledge and skill to provide quality work when you need it. We have established a reputation in Taylor, TX for the best garage door service around. We are committed to exceeding customer expectations, no matter what the job entails. At Action Garage Door, we strive to be your one-stop-shop for all garage door needs. We have the garage door expertise to help you with residential installations, commercial installations, cable repair, track repair, spring repair, general maintenance, garage door opener installation, garage door opener repair, and much more. 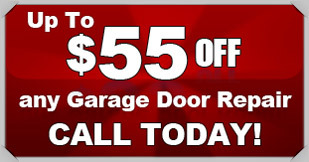 Call a garage door specialist you can trust. Call Action Garage Door in Taylor, TX. Overhead, Classica, Designer Choice and Oak Summit. All of our products come with warranties and are sold at competitive prices. Get in touch with us if you’d like to learn more about our garage door installation services for Taylor homes and businesses. Keep in mind that we are proud to offer in-home estimates on new garage doors at no cost. We research and find the highest quality materials to use with our maintenance and repair. There are a variety of materials to choose from that will fit any budget. From durable metal to classic wood, the choices are endless. We can help you choose a customized door that will fit your home or business. To speak to one of our expert garage door specialists, contact Action Garage Door in Taylor today, and we can discuss how we can help you with your garage door needs. Taylor, TX is a Williamson County city that lies about 34 miles northeast of downtown Austin. With a population of 15,191, the city has several big employers, including Electric Reliability Council of Texas, the T. Don Hutto Residential Center, Durcon Inc and Burrows Cabinets. 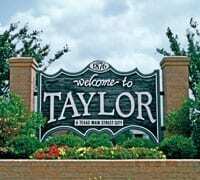 The average income per capita in Taylor is $21,311, while the average household income is $46,568. Taylor’s cost of living is lower than the U.S. average and the average in Texas, which makes it a budget-friendly place to live. Average home prices are also significantly lower than the state and national averages. Taylor’s average home price is $112,000, compared to the state average of $131,400 and the national average of $175,700. Taylor gives residents easy access to Austin and the surrounding area while providing a pleasant community for families and individuals. The city has great schools, a calendar full of local events, its very own farmers market for fresh produce and tons of opportunities to volunteer. Residents can help out at the Taylor Animal Shelter or join the Friends of the Taylor Public Library. Those who enjoy chatting with fellow residents while having fun can plan to attend the area’s local events, such as the Citywide Spring Clean Up, the Victorian Valentine Gala, Taylor Blackland Prairie Days, Movies in the Square, KidFish at Bull Branch Park and the Main Street Car Show. There are also recreational opportunities available for those who want to stay physically active in the community, such as adult softball, youth basketball, and youth soccer. Residents can also help keep Taylor looking green and fresh by participating in the Memorial Tree Program. The City of Taylor offers small-town ambiance while providing visitors with a number of attractions to see and amenities to enjoy. Shoppers and history buffs alike can stroll through Taylor’s historic downtown area, which features quaint buildings, antique shops, and specialty boutiques. The downtown area also has several places to dine, including charming cafes and bistros. Those who are more interested in checking out the city’s barbecue joints can head to Louie Mueller Barbecue for traditional Texas barbecued ribs, chicken, brisket and more. Visitors who come to Taylor for outdoor activities won’t be disappointed. The city has several parks to explore, such as Taylor Regional Park. 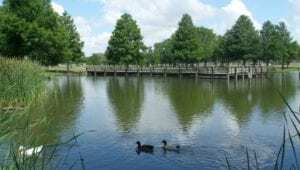 This park features a 6-acre lake and nature preserve, a fishing pond, playgrounds and more. Those who want beautiful views of the city can take the hike and bike trails that connect Bull Branch Park and Robinson Park. These trails cover 60 acres of land, giving visitors plenty of opportunities to take pictures. For those who appreciate cultural attractions, Taylor has the Moody Museum and 120ART. The Moody Museum gives guests a chance to learn all about Governor Dan Moody, the youngest governor in Texas, and the history of Taylor. The museum includes Moody’s home and garden. At 120ART, visitors can view a gallery filled with works of contemporary and traditional art and photography. Visitors who want to explore the city’s architectural features can take an architectural walking tour that includes more than 25 buildings. Those who take this self-guided tour have a chance to see a former hotel that was originally built in 1917, as well as buildings that date back to 1889. Old garage door opener and remotes. Changed batteries, still no luck. Gerald tried programming the remotes...again no luck. Programmed a new remote and installed a coded opener on the outside. We're back in business! Tyler was amazing and very knowledgeable. He fixed my issue right away and even helped me understand the issue I had caused.....I truly appreciated that. I would highly recommend your company as I have always received not only great service but always in a very timely manner. Thank you! When the spring on my garage door broke & I called late on a Friday afternoon, I just knew I wouldn’t be able to get repairs until the following week. However, Tyler came out the next morning & took care of the repair fast; he even installed safety cables (which I didn’t have) on the spot. The cost was also substantially less than I was expecting! I’m TOTALLY impressed with my experience & will definitely be back if I need garage door repairs in the future!! Came home from running errands, closed the garage door and heard a loud "clunk" signaling a broken spring. Action had someone at my house in just over an hour and the door was repaired less than an hour later. Tyler was polite and professional! They always call before they come so I have a good idea when they will arrive. The guys are always very pleasant and informative. I would not call anyone else as I have complete confidence in them. Tyler did an excellent job of replacing the garage door opener. Same day service and awesome price. He was very courteous and explained everything he did and gave really good proactive tips for future. Thank you!! Called for garage door opener service appt. Received same day service. Technician very friendly & professional. Replaced safety sensors on garage door opener.